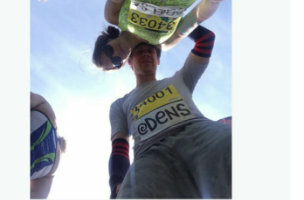 The wife of Foursquare's CEO created a fake bib to run in the Boston Marathon. North Carolina woman posts to Facebook before fatal crash. These stories, and more, in today's Morning Social Media Newsfeed. Dennis Crowley, Foursquare founder, ran with bib number 34001 at the Boston Marathon, which he qualified for this year as he was unable to complete the race in 2013. However, Mrs. Crowley did not qualify for a bib this time around. Rather than wait for her chance in 2015, they created a fake bib. Mashable The fakery was uncovered after Kathy Brown, the rightful owner of bib 34033, looked for pictures of herself on the marathon’s official photo site. She spotted Chelsa Crowley, who had written her Twitter handle — @chelsa — on her bib of the same number. New York Daily News Brown posted those pictures on Instagram and asked for help in identifying the unofficial runners, known as bandits. Now the Boston Athletic Association is investigating, and the tight-knit running community is asking whether social media are giving new legs to a tradition that is almost as old as the race itself. Boston Globe The Foursquare CEO wrote a public apology on WCVB’s website. Crowley, a Medway native, wrote, “Using a duplicate number to get Chelsa into the starting corral with me was wrong.” New York Post Crowley did little to shield herself from detection — and even scrawled her Twitter handle on her bib in pictures from the race. She later tweeted, “shh! !” after being asked whether the bib was fake before getting overrun with criticism. Police confirmed a Clemmons, North Carolina, woman was killed when her car veered into the path of an oncoming heavy-duty truck posted a message on Facebook a minute before the wreck. Courtney Ann Sanford, 32, posted a message Friday about “how the ‘Happy’ song makes her happy,” High Point police Lt. Charles Lanier said Saturday. The message was posted at 8:33 a.m., he said. Mediabistro recently sat down with Marlee Matlin, who talked about how she’s teaming up with Viki for the Billion Words March, a campaign to crowdsource subtitles for streaming video. “It’s not just a few people who need this. We’re talking about hundreds of millions of people around the world who are deaf and hard of hearing but who deserve access to entertainment, no matter what language they speak,” she said in a statement announcing the campaign. Facebook had a major outage on Sunday, with users all over the world reporting that while they’re able to access the site, it’s not actually showing any content in their News Feed. The site was showing placeholder images where your friends’ statuses should be. In related news, Facebook made some minor changes to the names of its various page administration roles, but their capabilities were not altered. The social network updated this section of its Help Center. Vitriol toward Clippers owner Donald Sterling surged through social media Saturday as outrage over his alleged racist comments in an audio recording found a home in tweets, Facebook posts and Instagram snapshots. The anger, usually attached to the fast-growing #DonaldSterling and #BoycottClippers hashtags, crossed the nation. John Oliver has been making the interview rounds to promote his new HBO show “Last Week Tonight.” And his show is getting clever on social.